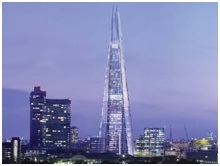 One development which is set for completion in May 2012, is the deeply anticipated Shard skyscraper. 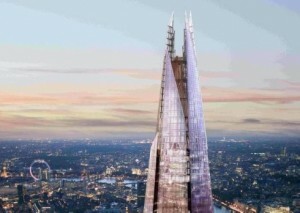 The Shard, which began as a sketch on the back of a napkin in a Berlin restaurant, has now been conceived as London’s most dynamic building, contributing successfully to the first phase of the £2 billion rejuvenation plan devised by architect Renzo Piano for the London Bridge Quarter. Renzo describes The Shard as a ‘vertical city, for thousands of people to work in and enjoy, and for millions to take to their heart’. This suggests that his intention was not only to create something that dominated the capital’s skyline but to construct a building that captures the hearts of the public and is visually appealing. The innovative use of glazing throughout the structure will certainly enhance the buildings look, turning blue after rain, and glowing a warm red in the evenings. The Shard itself will be the tallest building in Western Europe, housing a mix of high-quality offices and world-renowned restaurants as well as the 5-star Shangri-La hotel, exclusive residential apartments and the capital's highest viewing gallery offering 360° views. Another build that originally started construction back in 2008 is the Leadenhall Building. Located at 122 Leadenhall, London – the tapering 47 storey, 224m tower, designed by Rogers Stirk Harbour, is due for practical completion in mid 2014, and combines office spaces with retail and dining facilities. The tapered shape, provides floors of varying sizes, ranging from the largest at 21,000sq ft on lower floors, and the 6,000sq ft, at the top of the tower – all with equally impressive views of the city. Another city that through its architectural diversity is challenging the norm is Hamburg. Previously Hamburg’s skyline has been largely punctuated by soaring spires and towers, but now it has welcomed a new contemporary resident, The Sumatrakontor. This modern interpretation of Speicherstad’s dusky-red brick building, is changing the city’s skyline for the better. 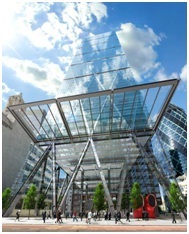 The 37,000sqm, ten storey building, sliced through with sections of glass, welcomes its visitors into an angular atrium, offering four separate areas – comprising of a five star hotel, various office space with conference facilities, retail units, as well as luxury housing with underground parking amenities. Keeping with the idea of innovation, China as ever provides us with an extremely impressive structure – however, this build is not considered an iconic or landmark building – what sets this structure apart is its construction speed. The entire T30 Hotel, a 30-storey building was erected in an extraordinary 15 days, and features quadruple-glazed windows as well as a 15cm-thick glass curtain wall insulation. 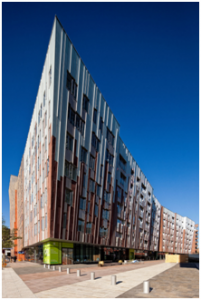 The T30 Hotel, a prefabricated tower, was designed to be highly sustainable both in construction and day-to-day running, with a heat recovery system and energy-saving lights throughout. This is the latest project from architect Zhang Yue of the Broad Group, a Chinese construction company specialising in sustainable building design. 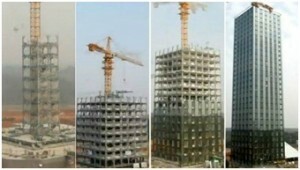 Built by 200 construction workers in just 360 hours, the 17,000sqm hotel has been tested by the China Academy of Building Research, and can resist a magnitude nine earthquake. 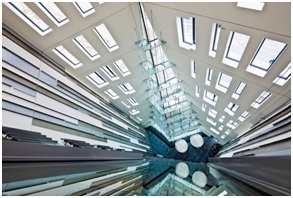 Continuing with the theme of innovative architecture and intelligently manufactured building materials, please explore the benefits of our vast range of glazing solutions, here.